Thanksgiving 2008--hard to believe that another year has passed and we are again starting the holiday season. I have so much to be thankful for today--and every day. With family to love; a warm, inviting home; friends; health--so many blessings. My parents celebrated their 55th wedding anniversary today--surrounded by all three of us kids (I use "kids" even though we are all now in our 50's!!!) and my sister-in-law. A small but wonderful gathering. I think students often don't realize how much a teacher likes to see the results of a class. I am always excited to view class work--whether still in pieces, a finished top, or completely quilted and bound! So here are more student works! Sue S. started this top in my Dresden Plates class at O'Susannah's in Watkins Glen. She increased the size from an 18 inch wallhanging to this beautiful piece. 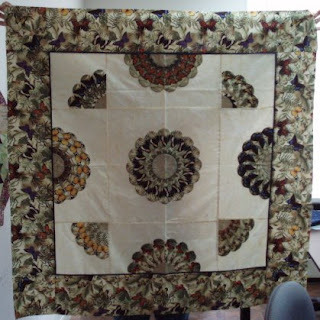 The fabric is butterflies and became even more stunning after being fussy-cut. 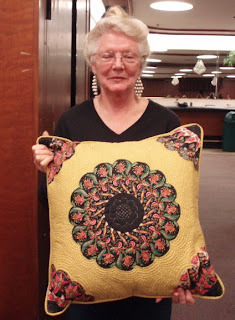 Pam brought her finished Dresden Plate pillow to the Glens Falls guild meeting. 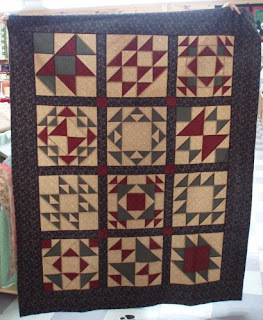 It is beautifully hand quilted both front and back. Then Cheryl brought in several projects she had also started at O'Susannah's. First is her hand quilting piece. The stitching is very even and looks the same both front and back! 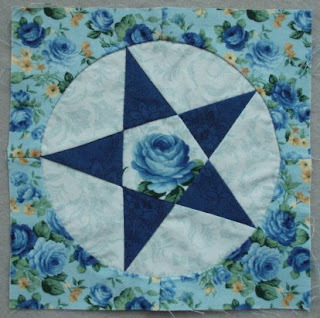 Next is her five-pointed star--hand pieced! 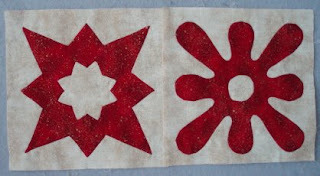 And these are the pieces she made at the Applique Day--All Points and All Curves. Such a variety of skills displayed! Thank you, ladies, for sharing your work. Kudos to all! As for me, I've been busy cleaning my sewing rooms--yes you read that right roomS! It had gotten to the point that I could not walk through and the closet door definitely has not been shut in several months. So I hauled several large bins upstairs to free up some space. The stuff in the bins are finished tops, backs, etc. and definitely did not need to take up valuable real estate where I work. I was able to free up enough space to add a small table at the end of my island--and can't believe how exciting it was to have two workspaces! Callie still has her fleece on the corner of the island, but is a bit better about not getting near the "action" area. My big adventure since the last post was locking myself out of the house with no house keys, no car keys and no cell phone! And Lynnie in the back of the Jeep ready to go to the vet's. It was a comedy (now) of errors to get in the house and then get her to the vet. Needless to say, we were late (the vet is wonderful and just laughed at the tale of woe). The folly started when I decided I did not want to take my purse with me to the vet's. Old coat, big pockets with food, leash, wallet and plastic bag. It wasn't until I closed Lynnie in the back of the Jeep that I realized I had no car keys. I am going to try really hard not to make that mistake again! Safe travels for Thanksgiving and enjoy your holiday! 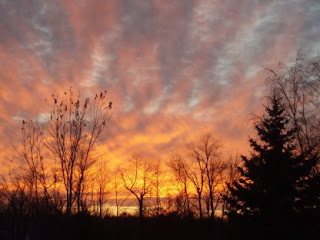 The far eastern part of New York State, that is!!! 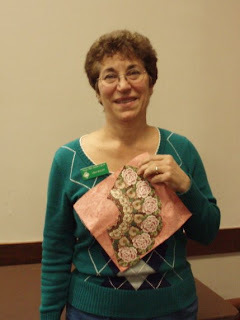 From November 6-8, I was the guest of the Wings Falls Quilt Guild in Glens Falls, NY. It was an incredible trip--here's the scoop! 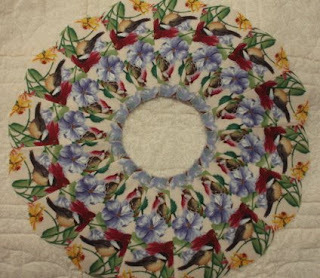 Several ladies did the all day Dresden Plates class on Friday--with fabulous results. 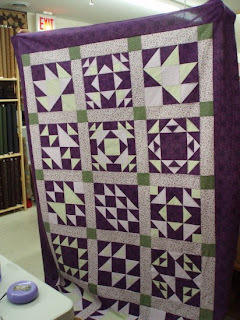 This is a picture of Joanne's block--her fabric had almost too many great motifs to choose from. 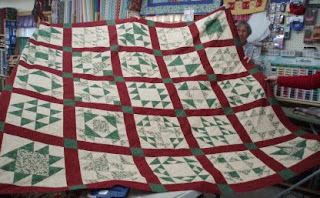 She had the entire plate (all 16 blades) fussy cut by hand, marked and hand pieced and pressed by the guild meeting on Saturday morning. Mary came in with a different idea, which I helped her modify to this! 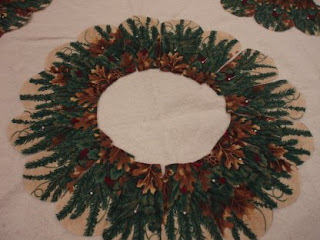 Her original plan was to cut the blades and then applique the ends of the branches to a background. By concentrating on the outer branches in the wide section of the blade, it looks like a real wreath! Mary cut two each of 8 blades and alternated them. She did cut all four corners so that the blades matched--so she could learn the technique I was teaching. What a fabulous idea to take the Dresdens even one step further! The happy faces: As we were packing up, I was able to get most of the group in a picture with the start of their plates. From left to right: Marie, Joyce, Carol, Joanne, and Gail. A wide range of fabrics with fabulous results. On Saturday I was able to get Linda M's picture with her plate. I was very fortunate to have a personal shop hop with Gail, my hostess, after the guild meeting. We went to several shops--each with a different flavor and focus. It was a great time and I had a chance to see many people I had met previously. 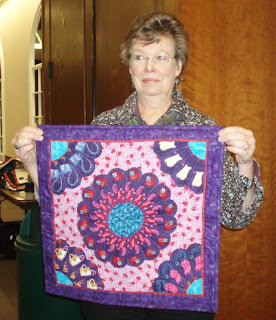 Many thanks to Linda D., Lucille, Audrey and Margie for parading my quilts around the guild meeting. (first time in several months) and I can walk through the room without having to go sideways! I am almost done prepping for the week's seven classes (in four days) and have my laundry (but not ironing) done. What a rush!! Next up: More student quilts--they are really prolific! It does a teacher proud! Do something nice for yourself today and every day--don't depend on someone else to do it for you--that could be a looooooooong wait! This is Nancy's quilt. She did a bit different set, eliminating the outer row of cornerstones and sashing for a more old-fashioned look. Nancy actually worked on two different tops at the same time--the other is shades of purple with a wonderful Asian border fabric. Pics when I see her next! 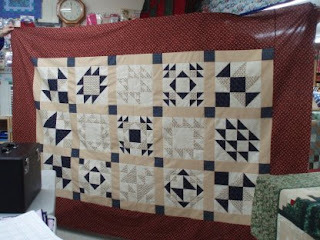 Believe it or not--this is Peggy's very first quilt top! She did an excellent job and her blocks were all the same size--no easy feat! She is deservedly proud of her accomplishment--and so am I! Linda G. chose a dark purple background and played lighter colors against it. Isn't it dramatic? Using the background fabric as her border finished the piece perfectly! Two Ginny D's were holding up a quilt...whose quilt is it? It always cracks me up with both Ginny's are in class--because both of their last names begin with D! In this case, it is the Ginny D. on the right who is the proud piecer of this beauty! 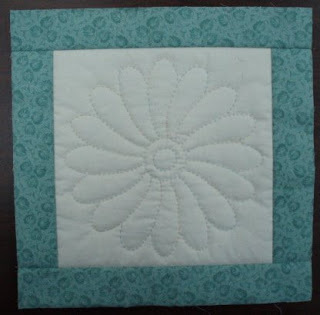 Her border fabric is a light blue with a strawberry print--perfect to finish this! The other Ginny D (left) also was working on a top, but preferred to wait til it was a bit farther along before photos. Rest assured, it is wonderful, as well. Great job, ladies! You do me proud. And the fact that you are such special women into the bargain makes it even better. That light to the north is me grinning broadly! The two Ginny D's make me think of a class where I had three Pats in a class of five! The one I knew the most became Pat C (because I knew her last name! ), and then there was Pat Plaid (she was wearing a plaid blouse) and Pat Stripe (who by sheer coincidence was wearing the same LL Bean shirt I was!). It was too funny throughout the day to call each by their "new" name. Pat Plaid said that she hoped the name did not stick forever! The biggest problem will be if they all show up in another class together but wearing different shirts!!!!! The next post will have pics from my trip to the far east--stay tuned! Well, it's over. And yet again, I did not get elected President of the United States. You know I ran in '04 and again this year--I just don't understand. So I am going to ramp up my campaign for '12--so prepare yourselves for a very serious campaign. 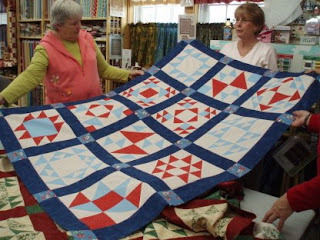 As hand quilters we will count BOTH sides in the count. No more counting the top stitches only! By golly, we made the stitches on both sides--we are darn well going to count them! The base of the food pyramid will be CHOCOLATE! And the dairy portion will the CHOCOLATE ICE CREAM! On that note, I am off to class. No pics today, but I have some of a wallhanging that I quilted in just one day (by hand) to show the next time. I just didn't want anyone (Annoying) to miss me!